The HP 364 ink cartridge is one of the most used ink cartridges in Ireland today used in over 50 different models of HP Printer. The highly successful Photosmart range is probably HP’s most popular inkjet printer in Ireland. The Photosmart printer uses four HP 364 ink cartridges; Black, Cyan, Magenta and Yellow. The standard cartridges unfortunately are not as good value as the high capacity or XL version. The original brand HP364Xl as you might expect holds double the amount of ink as the standard cartridge (approximately 550 pages). The real savings are with the compatible version of the cartridge with double AGAIN of the ink volume. The compatible HP364XL cartridge is filled to capacity and will hold enough ink to print approximate twice the amount of pages of the original brand cartridge. How is this everyone will ask? Well, to put it in simple terms, the HP 364 cartridge is filled with different volumes of ink depending on whether it is intended for use as a standard or high capacity ink. The original brand standard ink cartridges is filled with enough ink to print 250 pages and the XL version filled with enough ink to print around 550 pages at 5% coverage. Still, these cartridges are not filled to the top and it’s only when the compatible version is manufactured that the ink tank is filled to the very top and we get enough ink to print around 1100 pages! This constantly causes confusion among Photosmart owners as they assume that the compatible cartridges that hold all this extra ink are physically bigger and won’t fit in the printer. 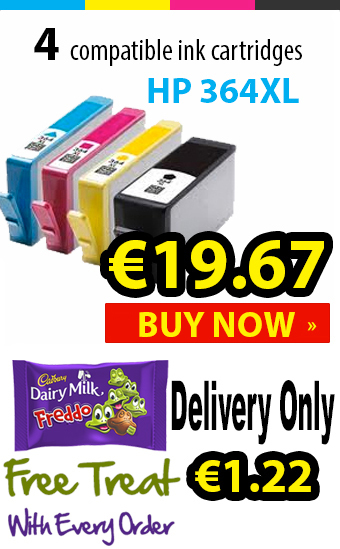 The compatible ink cartridge is becoming more widely used and is now available ‘chipped’ and that means the cartridge recognition by the printer is no longer the issue it once was. The savings on the cost of using a compatible HP364 cartridge against the original brand, taking into account the ink volume, is roughly 100%. More and more users are making the switch to compatible especially with the great incentives on offer to buy the compatibles such as free gifts or free ink cartridges. 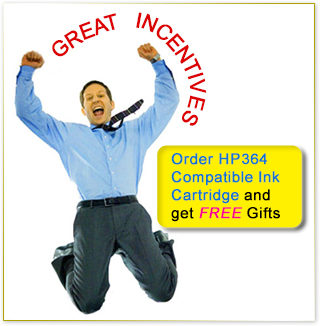 The availability of the compatible cartridges has revolutionised the way we buy HP364 ink cartridges with the benefit coming down on the side of the printer owner for a change. I purchased the Epson Stylus T444, T443, T442 and T441 last July 2014 and it was delivered to my work place Inpayment Section Block 3d GPO O’Connell Street, Dublin 1. I realised that i purchased it wrong one and should be HP 364 for Cyan, Yellow, Magenta and Black. I am trying to buy a new Epson printer with the inks above.